Walk on the wild side and enjoy the outdoors. Come and explore the beauty of the reserve on foot. 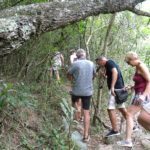 Enjoy a guided hike through the reserve with one of our trained guides. 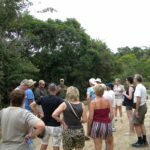 Your guide will inform you on the ecology, fauna, flora, bird and wild life in the reserve. block in summer and a warm jacket for trip in winter. Enjoy the beauty of nature in the sunshine and fresh air. Note: A minimum of 4 bookings is required for the excursion to go forward. 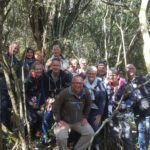 Included in this hike is an Umtiza tree forest (the second largest population in South Africa – more than 300 trees in a 1ha area). 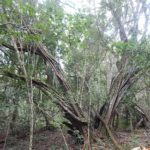 The Umtiza listeriana is a rare tree species in the legume family, found only in a small area of the Eastern Cape. 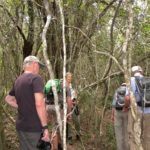 During this hike the guide will also take you to a grassland section of the Reserve where the cycad, Stangeria eriopus, grows. The combination of the grassland, the Stangeria eriopus and flowering plants create a symbiosis for the extremely rare Veniliodes setinata (a Cycad moth of the genus Veniliodes). A Lepidopterist specializing in the moth family Geometridae, Hermann Staude, recently visited us to collect samples to take for DNA sequencing. Times will be arranged per booking.